America's Atlas 5 rocket made its much-anticipated maiden mission from the West Coast early Thursday morning, piercing ground-hugging clouds and fog that blanketed the launch pad to send a secretive spy satellite into orbit. After an uneventful countdown, the rocket's kerosene-fueled main engine and single strap-on solid-propellant booster ignited at 3:02 a.m. local time (6:02 a.m. EDT; 1002 GMT) to send the 19-story rocket on its nightowl ascent to space from California's Vandenberg Air Force Base. The lone solid-fuel kick motor attached to the rocket's side gave the vehicle an unusual appearance. Rockets normally fly with either no strap-on boosters or else multiple motors. But the Atlas 5 vehicle was designed from its inception with the philosophy of each launch being tailored to the payload. If a cargo's weight needs the power of only one booster, then that's how the rocket will be built. Engineers explained that the solid booster's exhaust nozzle being aligned with the Atlas 5's center of gravity and the steering control provided by the Russian-made RD-180 main engine allows the design to work. Soaring atop 1.2 million pounds of thrust, the Atlas 5 headed south over the Pacific Ocean carrying a clandestine payload belonging to the National Reconnaissance Office -- the secretive government agency responsible for designing and operating the U.S. fleet of spy satellites. The solid booster burned about 90 seconds and later jettisoned, leaving the first stage to heave the vehicle to the edge of space before it was separated. That left the hydrogen-fueled Centaur upper stage to ignite and disappear from public view as the mission continued while in a news blackout. Citing the hush-hush nature of the rocket's payload, officials restricted information about the Centaur's maneuvers and deployment of the cargo from being announced live. About an hour after liftoff, the flight was declared a success. "Today's successful launch was the direct result of the dedication and excellence of the hard-working NRO, Air Force and ULA team," said Col. John Stizza, director of the NRO Office of Space Launch and NRO mission director. "This is a proud moment in our company's history," said Michael Gass, United Launch Alliance president and chief executive officer. "This launch caps four years of planning and hard work modifying (the launch pad) and then executing an outstanding launch campaign leading to this successful first launch." Trade magazine Aviation Week and Space Technology reported earlier this year that the Atlas would be launching an eavesdropping satellite for intercepting signals intelligence. "Such sigint spacecraft have proved important in tracking Al Qaeda and in searching for Osama Bin Laden," the magazine wrote. Amateur sky-watchers who track satellites as a hobby predicted the new satellite would be launched into a highly elliptical orbit stretching 23,500 miles at its high point and 700 miles at its lowest, inclined 63 degrees to the equator. The hobbyists believe this was the second in a new series of eavesdropping satellites. The inaugural West Coast launch of the Delta 4 rocket in June 2006 deployed its payload into such an orbit, known as a Molniya orbit. That Delta 4 cargo is widely believed to be a signals intelligence satellite that also hosts two piggyback payloads -- the Air Force's SBIRS Highly Elliptical Orbit missile-warning sensor and NASA's TWINS-A magnetospheric research experiment. Aviation Week reported that the Atlas payload would play host to the second SBIRS HEO package and TWINS-B. 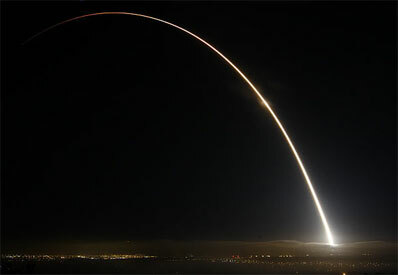 Thursday's liftoff took place at Vandenberg's refurbished Space Launch Complex-3 East pad. 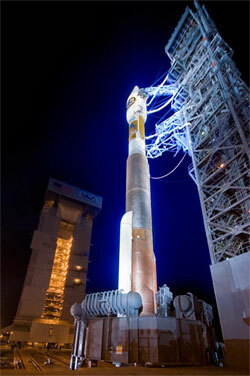 The site underwent a $300 million modification to accommodate the larger, more powerful Atlas 5. "The new SLC-3E combines the best features of the previous SLC-3E architecture and the new systems for the Atlas 5, yielding a state-of-the-art complex to meets our customer's needs, today and in the future," said Jim Sponnick, ULA vice president of Atlas Programs. "SLC-3E is a major accomplishment for the Atlas team in partnership with the Air Force and the NRO, and we are proud to demonstrate its capabilities by launching this important NRO mission to support national defense." The SLC-3 complex has been around since the early 1960s and Thursday marked its 34th Atlas launch. Prior to the transformation for the Atlas 5 era, the East pad was used three times by the now-retired Atlas 2AS rocket in 1999, 2001 and 2003. But in 2003, the Air Force penalized Boeing for wrongful possession of proprietary Lockheed Martin documents concerning the Atlas 5 rocket. The punishment transferred two Vandenberg launches originally slated on Delta 4 to the Atlas 5 and three new missions were assigned to Lockheed Martin. 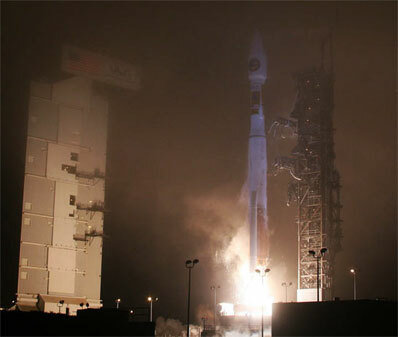 The flight carried out on Thursday, formally known as NROL-28, was one that had been shifted to Atlas 5. The U.S. military says having the Atlas 5 and Delta 4 rockets flying from the nation's two primary launch sites -- Vandenberg and Florida's Cape Canaveral -- assures access to space. United Launch Alliance, formed in late 2006, brought the Boeing Delta and Lockheed Martin Atlas rocket families together under one organization with the goal combining the engineering, manufacturing and launch operations of the two programs in an effort to reduce costs. Vandenberg's Atlas launch schedule has three additional launches firmly booked -- the Air Force's DMSP F18 weather satellite slated for liftoff no earlier than July 2 and the NROL-34 mission in fiscal year 2010, according to the Space and Missile Systems Center's Launch and Range Systems Wing. 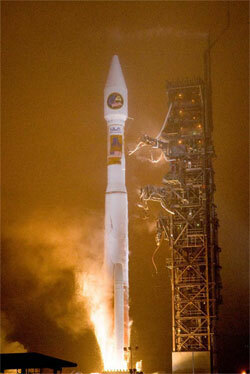 In addition, NASA has chosen the Atlas 5 to loft the next Landsat remote sensing satellite in 2011. Four more military launches have been assigned to Atlas 5, ULA officials said, but those missions have not entered the formal contracting process yet. Meanwhile, preparations are underway at Cape Canaveral for the next Atlas 5 flight. A commercial ICO mobile communications satellite is targeted for liftoff April 14. ULA says it needs a month between Vandenberg and Cape launches of the Atlas 5. "We have a customer requirement to be able to launch Atlas missions from one coast within 30 days from the launch of the last Atlas launch on the other coast. Our data review processes as well as our launch operations crew sizing and crew sharing operational approach are all directed toward accomplishing this 30-day separation," a company spokesperson said. After the ICO launch, attention will return to Vandenberg for the weather satellite deployment in July, then shift back to the Cape for the second of the Air Force's Wideband Global SATCOM communications spacecraft targeted for liftoff no earlier than August 2.